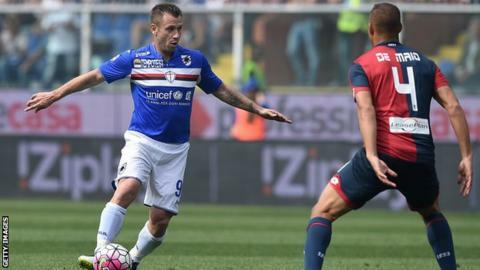 Former Italy international Antonio Cassano has dismissed talk of joining a Chinese club as "stupid", saying players only move there for money. The ex-Real Madrid striker, who played 39 times for Italy, has been without a club since leaving Verona last summer. But the 35-year-old is not interested in becoming the latest big-name player to move to the Chinese Super League. "It's stupid. I don't even remember the name of the team who want to sign me," he told Corriere della Sera. "For me, everyone is free to do what they want. But whoever goes to play in China should admit they are doing it for the money." Cassano made his Serie A debut for Bari at 17 and became the most expensive teenager in history when he made a £19.5m move to Roma in 2001. He went on to play for the likes of Sampdoria, Inter and AC Milan before twice changing his mind over retiring last summer, but he is open to extending his career - just not in China. "I want to know whether I can still make it," he added. "It needs a president and a coach who have 100% belief in me. Otherwise, I will leave it be. "However, if I do find it, I'll be ready. I'll sign for free. I have already earned enough money."